Apple last month brought the iPad Air (2019) aka iPad Air 3 with 70 percent boost in performance and as much as twice the graphics capability of its predecessor. A teardown coverage by iFixit has now revealed what are the internals of the new iPad Air that are making a significant upgrade over the iPad Air 2. There are components such as a larger capacity battery and Apple Pencil support that make the iPad Air (2019) a true successor to the model that debuted back in October 2014. The teardown also shows that despite carrying the iPad Air moniker, the new tablet has a list of similarities to the discontinued 10.5-inch iPad iPro. The iFixit team points out that the iPad Air (2019) “hails from the Pro line” and inherits the dimensions, Smart connector, and some other major features from the 10.5-inch iPad Pro that was launched in 2017. However, there is a new model number at the back to explicitly show newness. The new iPad Air is also noted to have a new Space Gray colour option, an absence of a camera bump, and two speakers over four on the iPad Pro to distinct the looks. Coming towards the upgrades over the iPad Air 2, the iPad Air (2019) is found to have a bigger capacity battery that has dual-celled 30.8Wh over the 27.6Wh available on the iPad Air 2. The battery pack on the new iPad Air model also has higher capacity over the 30.2Wh battery featured on the 10.5-inch iPad Pro. The engineers at iFixit have also found that the new iPad Pro model has an internal layout similar to the iPad Pro models. There is a central logic board similar to the premium iPads. Apple has also added its Pencil support and chips such as the Intersil 24882B and Parade Technologies DP825 timing controller that all were a part of the 10.5-inch iPad Pro. Nevertheless, there is the absence of the ProMotion 120Hz display. The new iPad Air instead has a traditional 10.5-inch LED-backlit Retina display with 1668×2224 pixels resolution. 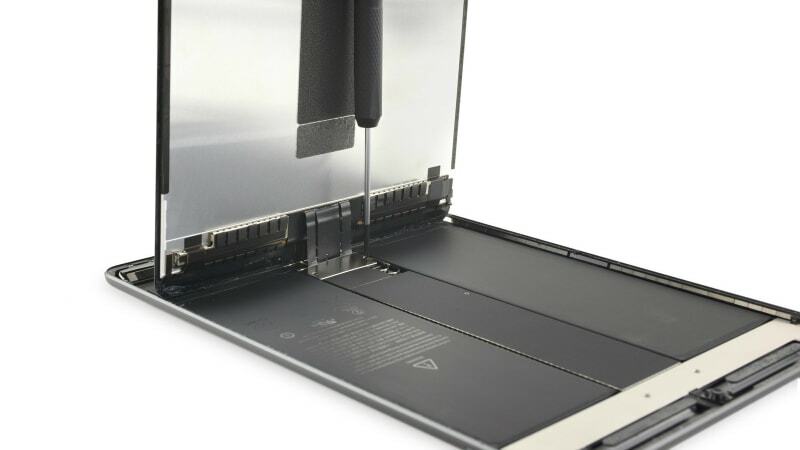 In terms of repairability, the iFixit teardown has concluded there is a large amount of adhesive that complicates all repairs on the iPad Air (2019). The model does have many modular components that can be replaced independently, but its Lightning port is soldered to the logic board. Similarly, battery replacement of the new iPad Air is “unnecessarily difficult” though possible. The iFixit team has given a repairability score of 2 out of 10 to the iPad Air (2019). This is notably identical to what was received by the iPad mini (2019) earlier this week.